From sausage-stuffed mushrooms to drunken clams with sausage, these hearty dishes will help you power through the winter doldrums. We have no bone to pick with fruit. We have no beef with vegetables. But let’s be honest: sometimes what we really want is meat. To get your fix, try these 10 hearty dishes featuring one of the best (and most versatile) meats around: sausage. Sheboygan-Style Bratwurst. Okay, fine. Bratwursts are technically for summer. But don’t let winter’s lack of sunshine hold you down. 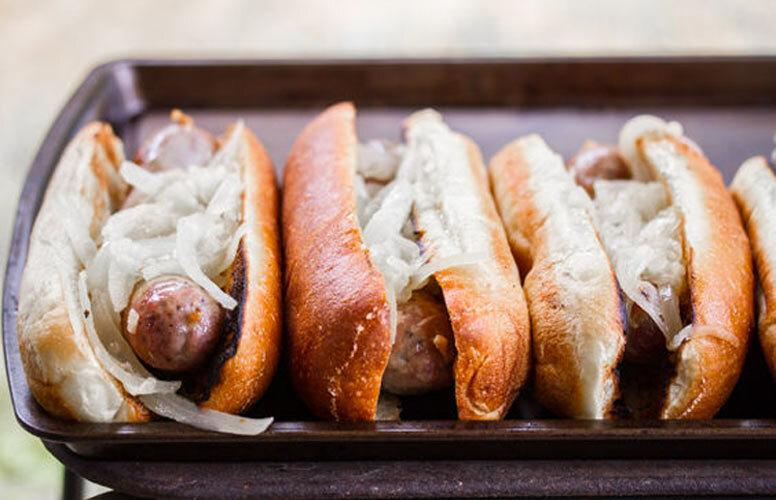 Homemade bratwursts are a project that is worthwhile in every season. Get the recipe. 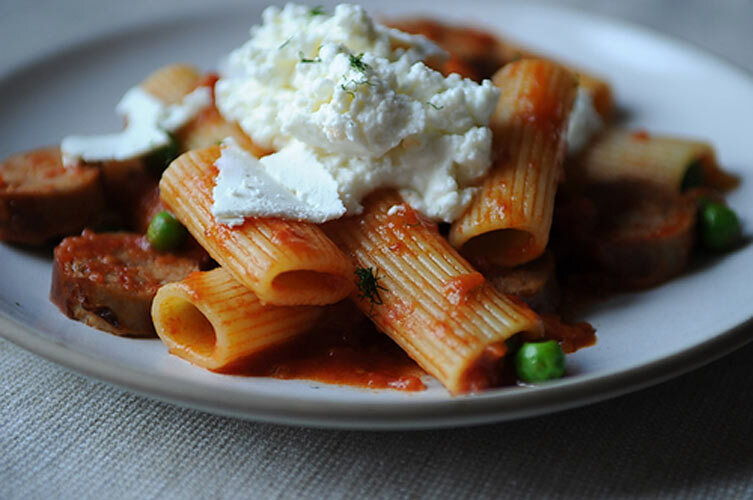 Rigatoni with Sausage, Peas and Fresh Ricotta. A piquant tomato sauce laced with fennel and garlic gets an upgrade with savory pork and green peas. The creamy ricotta generously dolloped on top mellows the spice of the tomato sauce. Get the recipe. Creamy Sausage Stuffed Mushrooms. 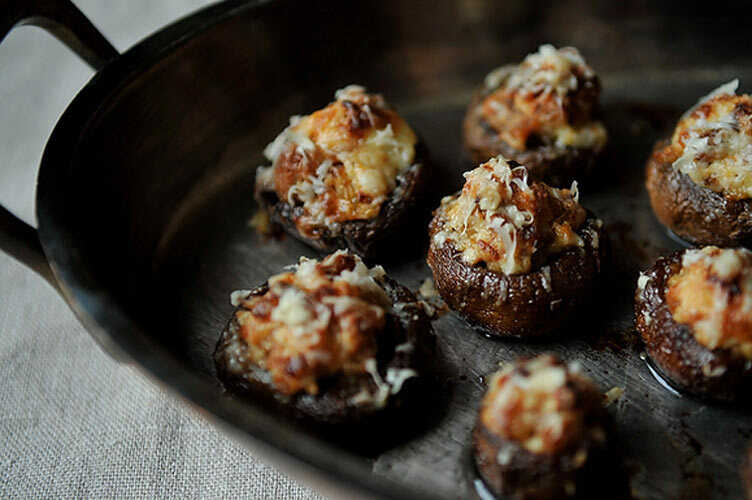 A quick toss with balsamic vinegar before cooking gives the mushrooms a touch of sweetness and acidity that pairs perfectly with the savory sausage and cream cheese filling. Bookmark these for your New Year’s Eve party—they’re a perfect foil for bubbly cocktails. Get the recipe. 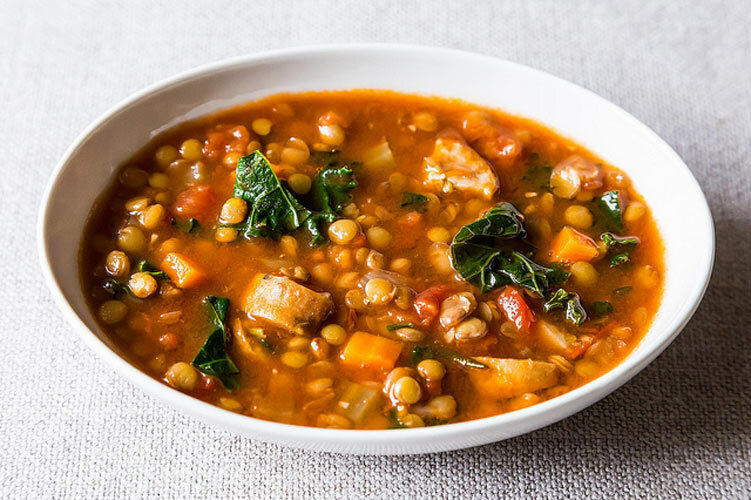 Lentil and Sausage Soup with Kale. You know that moment when you kind of forgot about dinner and your fridge is mostly empty and thoughts of Chinese take-out are swimming in your head? This soup is the solution. It is remarkably forgiving, and you can swap in just about anything you might have in your mostly empty fridge, pantry, or freezer. Get the recipe. Sausage and Kale Dinner Tart. 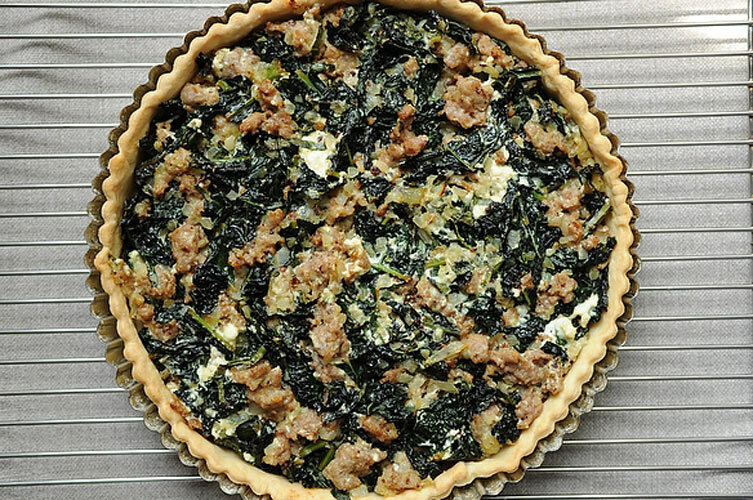 Start with flaky pastry dough and dress up the kale and sausage filling with ricotta, white wine, and fresh basil. All that’s left is to bake...and name the size of your slice. Get the recipe. Drunken Clams with Sausage. 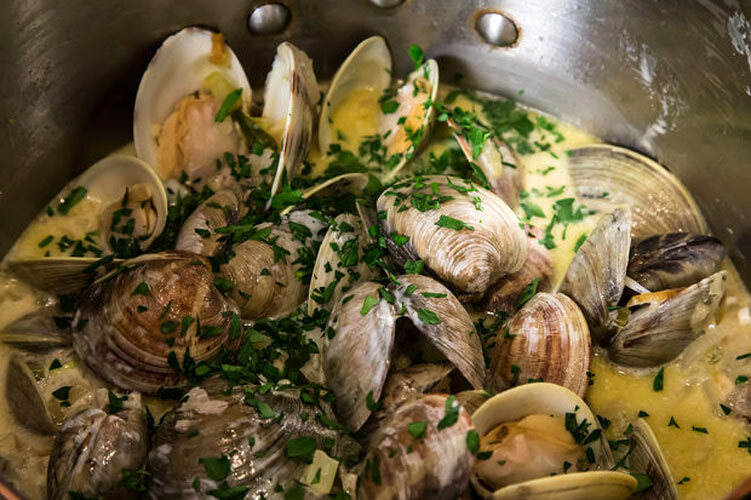 Clams have an unlikely new soulmate: sausage. Add not one, but two types of white wine, a little tarragon and parsley, a splash of heavy cream, and the matchmaking is complete. Get the recipe. Strata with Sausage and Greens. Forget spending your morning sweating at the stove, churning out stacks of floppy pancakes. 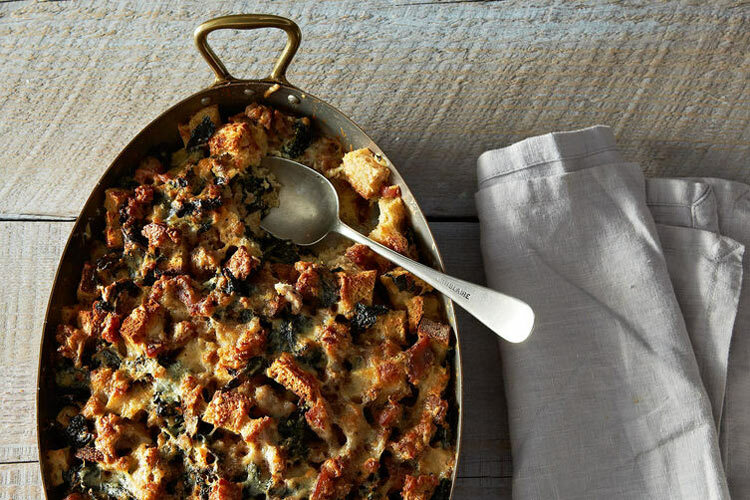 Make this savory breakfast bake streaked with cheese, sausage, and sauteed greens the night before and sleep in. Get the recipe. 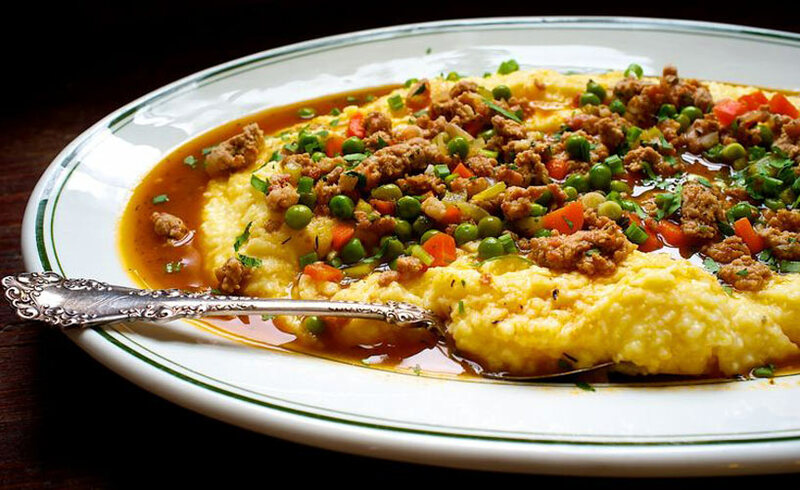 Polenta with Peas and Pork Sausage. 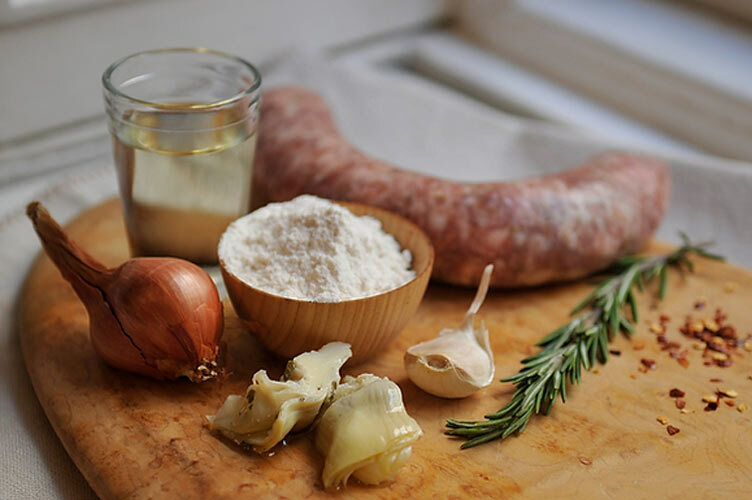 Homemade pork sausage is easier than it sounds (hint: pancetta is involved). Make it into a ragu and serve it with peas and creamy polenta for a dinner perfect for any chilly winter night. Get the recipe. Chicken with Sausage, White Wine and Artichokes. Sweet Italian sausage and artichoke hearts swim in a rosemary-white wine sauce around tender chicken thighs. Serve with roasted potatoes, rice pilaf, or just with a good hunk of crusty bread to sop up the sauce. Get the recipe. 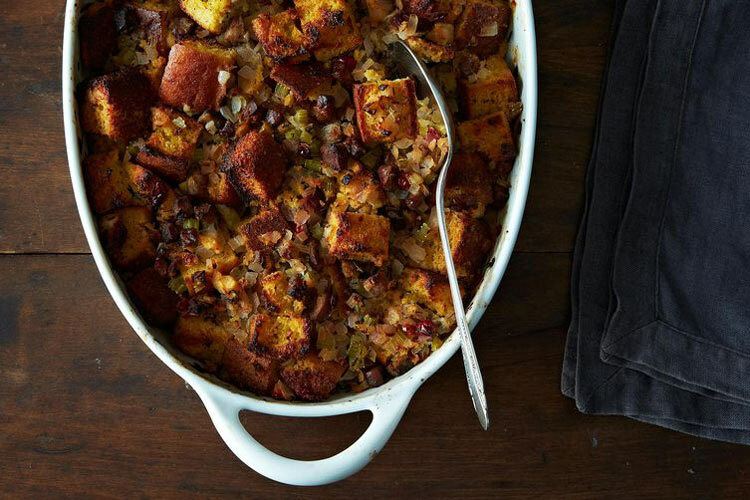 Andouille Sausage and Cornbread Stuffing. This combination of two Southern classics is perfect for the holidays. The spicy Andouille sausage studs tender cornbread, and is the perfect contrast to tart apples and cranberries. Get the recipe.